Whether you are in the process of constructing a new home, renovating your existing home, or preparing to put a house on the market, you should know that a great way to improve its value is through quality landscaping. Landscaping adds natural beauty to your home and can reflect your sense of style, based on the colors, shapes, and sizes of the plants you put in and how they are arranged. 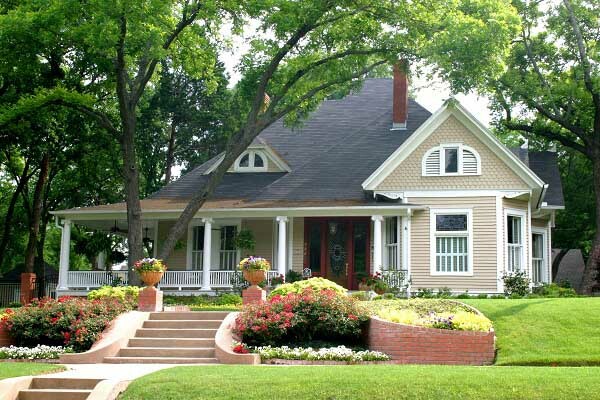 For better curb appeal, add a variety of new landscaping features to the property. For example, include several trees to bring shade and beauty. You might want to add some shrubbery or a garden in the front yard. Or, you could tear out your lawn and substitute xeriscaping, which can include a rock garden and plants that do well in areas with little moisture, such as cacti and sage. Of course, not all landscaping has to do with plants. For example, you can include paving stones in the garden and add accent boulders. For flowers, you can consult with your landscaping professionals about what options do best in your area’s climate. Quality landscaping will do more than beautify your property. It can also help you save a great deal on energy costs. This boosts curb appeal, since people shopping for homes will be more likely to purchase a dwelling that costs less to keep cool during the hot Texas summers. “On average, a well-designed landscape saves enough energy to pay for itself in less than 8 years,” according to a report from the U.S. Department of Energy. Adding trees for shade in a properly planned landscape can cut down air conditioning costs by 15 to 50%, noted the DOE. If you design the landscaping to include native plants that require less water, you will further cut down on your utility bills. The value of your home is at stake when you begin to make changes to the landscaping. This is why you will want to work with landscape professionals who have experience helping homeowners improve their property in Texas. For best results, do not rely solely on advertisements to find a landscaper, noted a report from the Federal Trade Commission. Instead, do some research, asking colleagues, family, friends and neighbors if they can recommend a great landscaper. Check out online reviews to see what other customers have to say.